ZUCCHINI: THE RAW & THE COOKED | Jane Lear. Writing on Food and Travel. Zucchini has quite the reputation. The plants are prolific as hell, and with the effortless pick-up of a sports car, their offspring zooms from the cute, almost-ready-to-pick stage to the size of a cricket bat (see above) in no time. Garrison Keillor, chronicler of the small, fictional town of Lake Wobegon on A Prairie Home Companion, has a perennial joke/universal truth about having to lock the car in the summer, or else someone will leave zucchini inside. Like many cooks, I’ve long been prejudiced against overgrown zucchini. Generally speaking, the skin can be a bit tough, and the flesh more starchy than succulent. But the outsize bounty from our neighbor’s garden has changed my mind. It could be the particular variety, or the soil, or the utter freshness, I don’t know. But Sam and I have been happily sharing in the largesse because it’s been absolutely wonderful—tender, juicy, and living proof that the words mild and bland are not synonymous. Our neighbor never means to let the zucchini get out of control, of course, but she’s not there every day to keep a close eye on it. And anyway, zucchini has a mischievous streak: It lurks under the cover of big, floppy leaves, seeing what it can get away with and provoking startled outbursts (“Good God, I never even knew that one was there“) from home and market gardeners alike. The novelty may have worn off, but zucchini can still be a go-to restaurant signature dish. I can’t eat at The Red Cat, in Chelsea, for instance, without ordering the “quick sauté of zucchini,” with almonds and pecorino. One of the world’s easiest waste-not-want-not vegetables, zucchini requires nothing but a good rinse and minimum trimming. It adds lightness to ratatouille, and cut lengthwise into thickish slices and tossed with olive oil, it is well-mannered on the grill. Personally, I’ve become very fond of it raw. 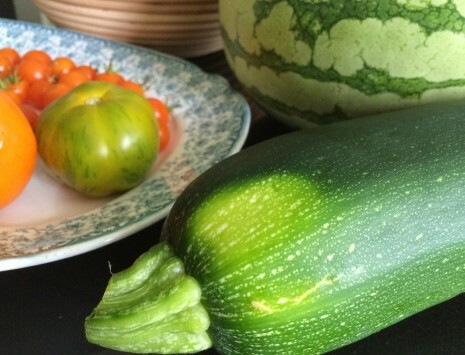 One of this summer’s discoveries is that if it’s garden-fresh, bigger is better. The rounded flavor is miles away from the slightly bitter, unripe taste of an immature specimen. The recipe directly below is a great favorite. I made it just the other day for a Slow Food potluck, and not only did it survive a few hours in the way back of a car, it got better. And now that the weather is cooling off, I’ll be spending more time behind the stove. Forget dicing, cubing, or cutting into matchsticks: An abundance of zucchini is much less intimidating if grated, left to drain, and then sautéed. Any leftovers are delicious in an omelet or frittata. This recipe is from Francesca Cianci, a Florentine who once cooked at Mezzaluna, a trattoria on the Upper East Side. It was first published in Red, White & Greens: The Italian Way with Vegetables (Morrow, 1996), by Faith Willinger, an authority on all things Italian and a longtime contributor at Gourmet. If you want to go in a different direction, flavor-wise, substitute a mix of fresh mint and marjoram for the arugula, and feta for the Parmigiano. For cutting the zucchini, you’ll need a mandoline or a (far less scary) handheld adjustable-blade slicer; my brand of choice is Benriner, available at J.B. Prince for about $25. 2. Arrange the slices, overlapping them slightly, in one or two layers on a large platter and scatter with the arugula. Drizzle with oil and vinegar, then season with salt and pepper. Using a vegetable peeler, shave curls of Parm on top. This simple sautés delicious on its own, but you can give it finesse by topping it with a handful of pine nuts, toasted in olive oil and butter on the stovetop. Or you can channel The Red Cat and shower it with toasted almonds and pecorino. Hard to go wrong, really. 1. Grate the zucchini however you like—by hand or in a food processor. Toss it in a colander with about 1½ teaspoons salt. Set the colander over a bowl and let drain 20 to 30 minutes. Squeeze the zucchini dry by handfuls in a clean kitchen towel (not terry cloth). 2. Heat the oil in a large skillet over medium-high heat and sauté the shallot until softened. Add the zucchini and cook, tossing, over high heat for a few minutes, just until tender. Season with salt and pepper.